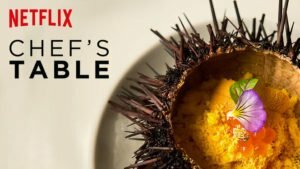 The Netflix documentary series Chef’s Table, created by David Gelb (director of Jiro Dreams of Sushi, the 2011 documentary film about 85 year old Jiro Ono, considered by many to be the world’s greatest sushi chef), is now in its third season. Each episode of the globetrotting show has focused on a single world-renowned chef, including chefs from Italy, Argentina, Australia, Sweden, Brazil, Mexico, Slovenia, Thailand, South Korea, Russian, Germany, Peru and six from the United States. In 2015, it won the award for Best Episodic Series (for its first season) from the International Documentary Association. The second episode focused on arguably the second most famous farm-to-table chef in the U.S. (after Alice Waters): Dan Barber, who is the executive chef and owner of Manhattan’s Blue Hill in Greenwich Village and its sister eatery, Blue Hill at Stone Barns in Pocantico Hills (Westchester County, NY). The literary-minded Barber, who is the author of The Third Plate, Field Notes on the Future of Food (The Penguin Press, New York, NY, 2016) has also garnered much praise for this thoughtful, memoir-like book that sought to define the meaning of ethical and delicious eating. But it is Dan Barber’s two restaurants, famous for astoundingly fresh flavors and innovative preparations on their “grazing, rooting, and pecking” tasting menus of seasonally sourced foods, which likely prompted The Chef’s Table creator to choose Barber for the second episode. With a raft of glowing reviews and coveted spots on lists like the The World’s 50 Best Restaurants, the restaurants are destinations for lovers of fine food, and the Chef’s Table episode on Dan Barber (a short hour’s worth of filmmaking that is deeply engaging and satisfying), is a must-see for omnivores mindful of the food on their plate. 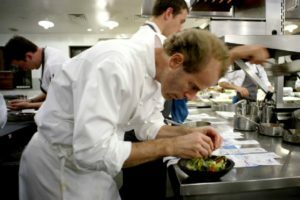 The show portrays Dan Barber as a restless renaissance man, questioning everything on his way to reconnecting farms to forks and building a new American culinary tradition some have called revolutionary. It follows Barber’s obsessions with food, farming and inventive cooking — and the life experiences that birthed them — and is filled with candid footage from his work life, personal life and interviews with people who’ve watched his star rise. The result is a surprisingly intimate portrait of his life, his way of thinking about food that will heal the land and taste good, and, most of all, the determination needed to do all that he has done to become the voice of the farm-to-table movement (as expressed by food critic Ruth Reichl on the show). As the episode weaves together anecdotes of his early life, his culinary background, the operations at his restaurants and his work with farmers, a surprisingly complicated picture of Barber’s life and personality emerges. The viewer gets to see Barber’s energetic and groundbreaking approaches to food and farming behind-the-scenes. On display is the dedication and disciplined commitment of one of the farm-to-table movement’s standard-bearers in the kitchen and in the fields, idealistically pushing the boundaries of American cuisine and its relationship to farming. On this level, he is an unqualified success. But, as the show makes clear, the life of a creative pioneer is not always smooth sailing. It was with these life lessons behind him that, in 2000, Barber and his brother David (whose business expertise was especially noted in The Third Plate), founded Blue Hill as a simple bistro in the NYU student-dominated Greenwich Village neighborhood. Just opening a restaurant in Manhattan and keeping it open is a success. But for someone like Dan Barber who’s always looking for new things and new ways to change the world, a simple eatery wouldn’t be enough. The watershed moment for Barber came on a day in 2002. After returning to Blue Hill from a trip to the farmers’ market to find fresh asparagus, he discovered that someone at the restaurant had accidentally ordered a huge supply of the vegetable. Surrounded by stacks of boxes of asparagus in his walk-in, Barber says that he just lost it. After getting over his frustration, he decided to make the figurative lemonade by trying something crazy. For that night’s service, he went all in on asparagus and decided to incorporate it into every dish — including an asparagus ice cream. The idea was meant to be something of a one-off joke but, as fate would have it, LA Times food critic Jonathan Gold happened to stop in to the restaurant that night. Barber was horrified. But the joke turned out to be a bold, and lucky, stroke of genius. Gold’s subsequent review praised the inventive meal that put the spotlight on a vegetable at its peak season. The review put Barber on the culinary map and the rest is history. Since that day, he’s relied on that same inventive intensity to push his two restaurants to constantly challenge the conventional ways dishes and their ingredients are prepared and presented. The series of fascinatingly plated creations from his restaurants, beautifully filmed, demonstrate the amazing results and include imaginative dishes with evocative and original names, like tobacco-wrapped eggplant on fire, mushrooms cooked in compost and red pepper egg with everything the chicken eats. But the elegant simplicity of his ingredient-focused dining is, of course, only part of Barber’s goal. His sights are set on developing a truly American cuisine that’s rooted in regional farm foods. This holistic vision to transform agriculture and develop a diverse and sustainable regional farm economy, driven by health and flavor, undergirds the creation of Barber’s culinary wonders because he knows that great meals can only come from great farms. As Reichl notes, “If you don’t have good ingredients, you can’t make good food — it doesn’t matter how good your technique is.” And Barber has his own farm to experiment and learn on. The fertility of the Barber farm had suffered from years of neglect. Livestock was reintroduced to rebuild the farm ecosystem, and the culinary possibilities unfolded. The manure of dairy cows at pasture restored nutrients to the fields that had only been hayed for years. Chickens helped to spread out and break down the manure, and pigs, to root at the forest edge, added to the farm’s diversity. Finally, they started raising veal calves (free roaming and kept on their mothers’ milk) which inspired Barber’s veal tacos with kohlrabi and coriander. Barber soon realized that the ultimate goal was improving the whole system; because when you improve the soil, you improve the grass, which improves the flavor of the milk and the meat, which in turn can lead to great meals. As Michael Pollan says, you are what you eat eats, too. Barber brings this same holistic and inventive spirit to his partnerships with other farmers. For example, he buys rye from organic farmer Klass Martens’ Lakeview Organic Grain in upstate New York’s Penn Yan (in the Finger Lakes region) for his breads. In the not too distant past, Martens would routinely turn it under as a cover crop to improve the soils and take it as an economic loss. 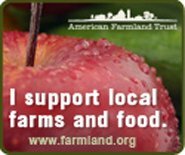 But Barber believes that if we truly care about healthy food and great flavors, farmers should have an economic incentive to replenish their soils. He’s made a point to incorporate the cover crop into his cooking and he hopes other chefs follow his lead. But nowhere is Barber’s work to connect the farm to the table more evident than at the operations of Blue Hill at Stone Barns, where the daily collaboration between chefs and growers, field and plate is as intimate as it gets. The menu at Stone Barns is fully seasonal, based on what’s ready from the forests (maple syrup, foraged greens and mushrooms), the fields and greenhouse (greens, vegetables, fruits and roots), the pastures (eggs, chickens, pigs, lambs) and the cellar (pickled and cured goods). More than just wowing taste buds, Barber believes showing people this connection is as much an ethical as it is a culinary act. The role of his menu is to “put the pieces back together” for people because, as he sees it, the place where agriculture, the economy, the environment and society can all truly reconnect is on a plate of food. With a business as holistic and a vision as grand as Barber’s, you begin to see why he puts so much pressure on himself, why he still puts in long hours in the kitchen and why he brings every ounce of creativity he can muster to each and every one of his dishes. Thriving on the excitement that comes from innovative risk, Dan Barber’s words, summing up his passion, reverberate, If you’re not about to fail, you’re not really cooking — you’re not really caring.